Staff at the airline are believed to be angered by plans to have them cover the routes of striking Aer Arann pilots. A COMPLETE SHUTDOWN of Aer Lingus services could be on the cards, if pilots vote to ratify industrial action at the airline. Strike ballots were delivered to pilots earlier this week by the Irish Airline Pilots Association (IALPA). 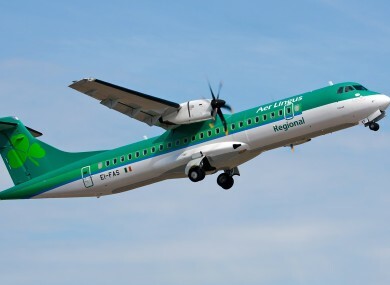 IALPA is worried that Aer Lingus pilots could be drafted in to cover Aer Arann services in the event of a planned strike action next Tuesday, Wednesday, Saturday and Sunday. Aer Arann pilots are protesting a pay freeze which has been in place since 2008. The Aer Lingus ballot will be finished next Friday, 23 August. Pilots would then be required to give seven days notice before they went on strike. Aer Arann operates 25 routes on behalf of Aer Lingus. However, the company says it knows nothing of the ballots. “The company has not been notified of any ballot by Aer Lingus pilots for strike action. An agreed statement by Aer Arann and IALPA says that talks are ongoing aimed at avoiding the strike. Email “Aer Lingus pilots balloted on strike action, but company says it has not been told”. Feedback on “Aer Lingus pilots balloted on strike action, but company says it has not been told”.